Fed up of spending your Christmas day in cold, drizzly weather? Come and soak up some winter sun, and enjoy the festivities in Nice and the French Riviera. There’s plenty to do from the Christmas markets to traditional swims in the Med. You can stroll along the Promenade des Anglais, the palm trees dressed with illuminations, including a giant Father Christmas outside the Lenval children’s hospital. Head down to Place Garibaldi, passing Place Massena and enjoy a vin chaud whilst taking in the dazzling display of Christmas lights including a giant Christmas bauble you can walk through. The most popular attraction in Nice is the Christmas Village, usually held in Place Massena. This year its base is the Albert 1er Gardens, just next to Massena, and you can visit between 11am to 8pm (9pm on Fridays and Saturdays). The Village holds around 60 wooden huts, where locals sell perfect last-minute gifts of artisan products such as candles and Christmas decorations. We all kid ourselves we’re looking at the gifts, but really, we’re all ready to indulge. Who can resist traditional German Bratwurst, or a Crêpe. The Village is family friendly and there’s the expected Santa’s grotto where excitable children can meet the man himself (though keep in mind the grotto is only open from 2:00pm to 7:30pm on Wednesdays, weekends and during the school holidays). Don some skates for the ice skating rink, which holds sessions at 11am, 12:30pm, 2:00pm, 3:30pm, 5pm and 6:30pm at the low cost of €5. 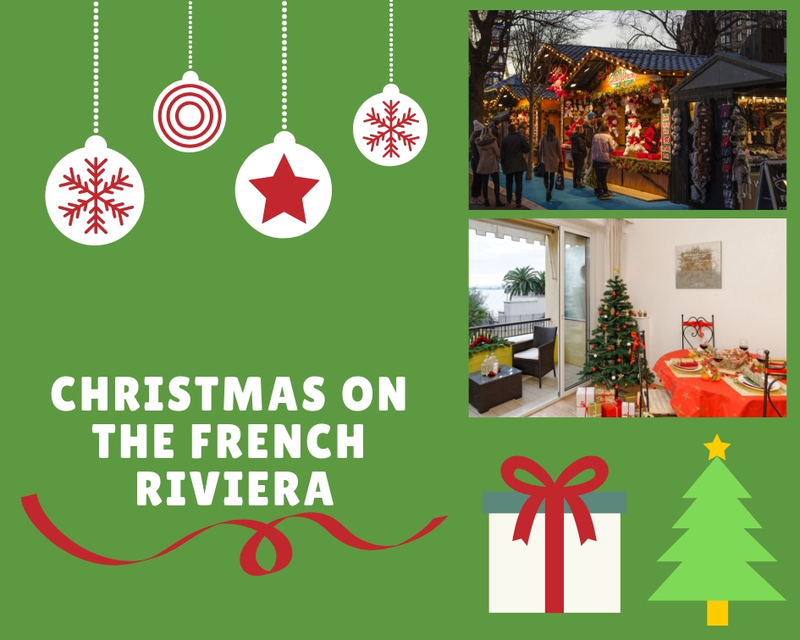 For less crowded Christmas markets, Aix en Provence and Monaco have markets very similar to the one in Nice, but for something a little different, head to Roquefort les Pins; each year, they celebrate World Christmas traditions including Peru, Haiti and Holland. Sadly though, it’s only a one-day thing – the rest of the time it’s main market is similar to the others. You should check the tourist offices on-line for each town, but generally, all are open through-out December. If it’s quaint and traditional you’re after, a 30 minute drive north of Nice will take you to the small medieval village of Lucéram. Slightly off the beaten track, the small streets are decorated with 450 Crèches (nativity scenes in English) put together by the residents. Every nook and cranny of the village is decorated; even the village bread oven. This Circuit des Crèches starts on the 8th of December and lasts for one month. There is a smaller, similar version in Nice on Place Rossetti square is transformed into a nativity scene. Have you thought about the Opera? Fantastic at Christmas, there are a few festive concerts taking place in this magnificent building this year. On the 19th of December at 8pm the Opera is hosting a concert where children will be singing carols which is free of charge. Also, for one weekend only on the 21st (8pm) and 22nd (4pm) of December the philharmonic orchestra of Nice will be playing for their concert ‘Noël Jazz ‘n Bach’. This costs €18 for adults but only €5 for students. Hotel Hyatt Regency Nice Palais de la Mediterranee. 13 Promenade des Anglais. Tel +33 (0)4 92 14 76 00. €79 per person excluding drinks. Restaurant Les Palmiers. 1 avenue des Palmiers. Tel +33 (0)4 93 84 48 74. €45 eper person excluding drinks. Restaurant Les Jardins du Capitole. 52 Promenade des Anglais. Tel +33(0)4 93 44 78 81. €45 per person excluding drinks. Restaurant L’Ane Rouge (see our blog post on this restaurant, which we really recommend!). 7 Quai des Emmanuel. +33(0) 4 93 89 49 63. €70 for two courses, €90 for all 3.